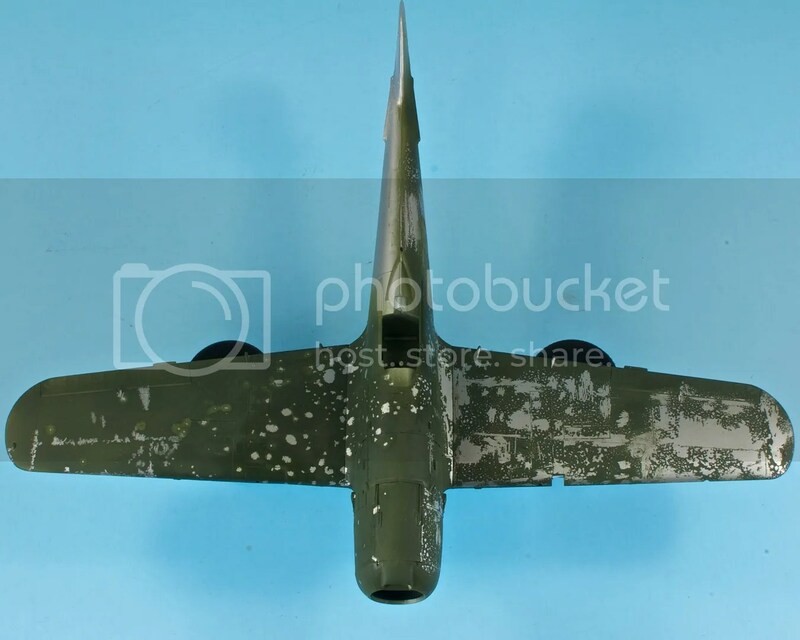 Compared to some Japanese fighters, the N1K1 George wore a pretty simple scheme of dark green over bare metal undersides, with the usual yellow ID bands on the leading edges of the wings. 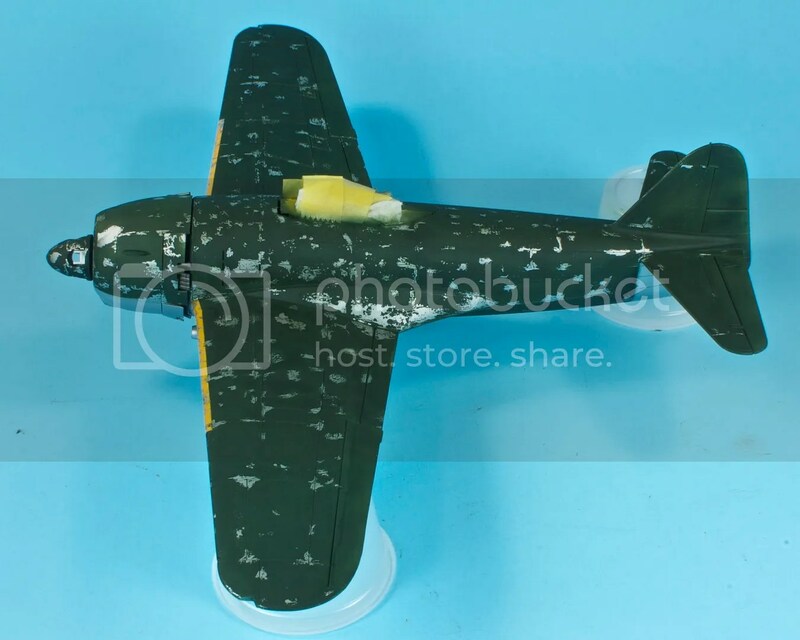 The challenge with this paint job is that, like many other later-war Japanese aircraft, the George was often painted without a primer undercoat, and with poor-quality paint as the Allied onslaught took its toll on resources and production. As a result, the paint chipped and flaked off with ease. 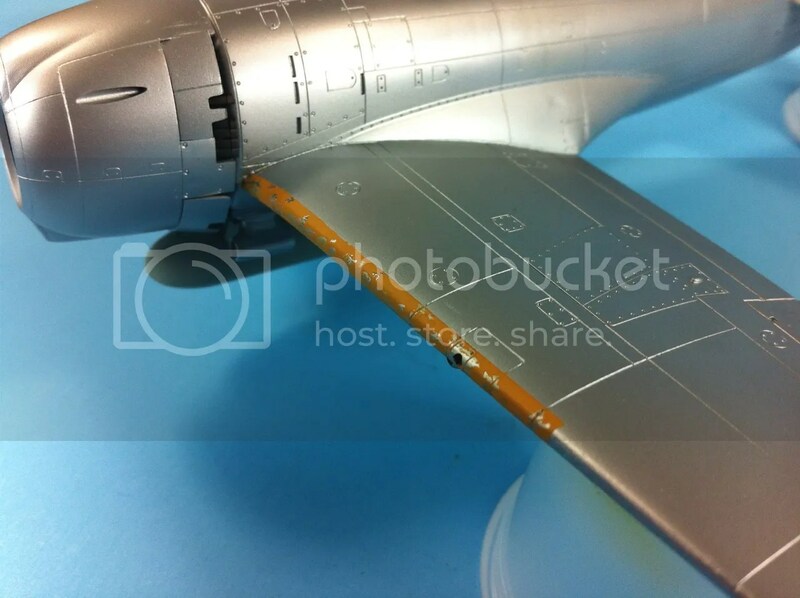 Recreating that chipping – a first for me on such a scale – was the real challenge of this paint scheme. More on that later. 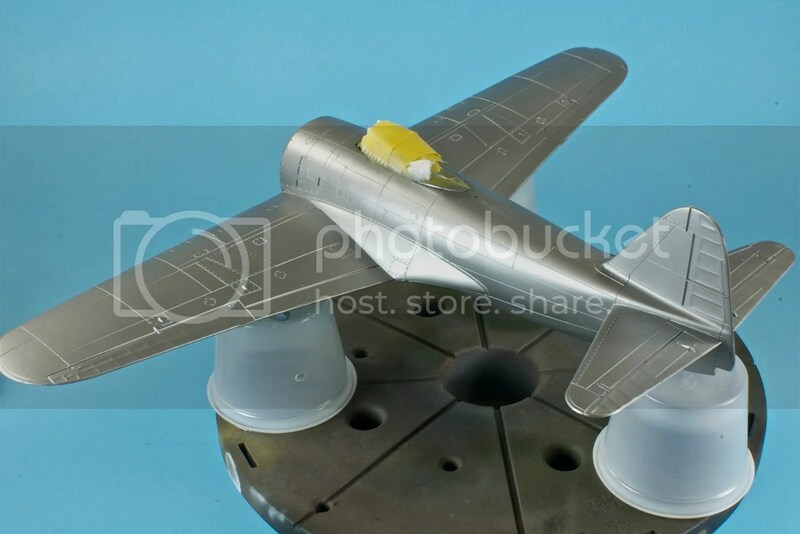 Considering that the George would need to be painted all over in bare metal – for the exposed underside and the chipping up top – I elected to forego primer and spray the entire plane with Tamiya’s AS-12 Bare Metal Silver. 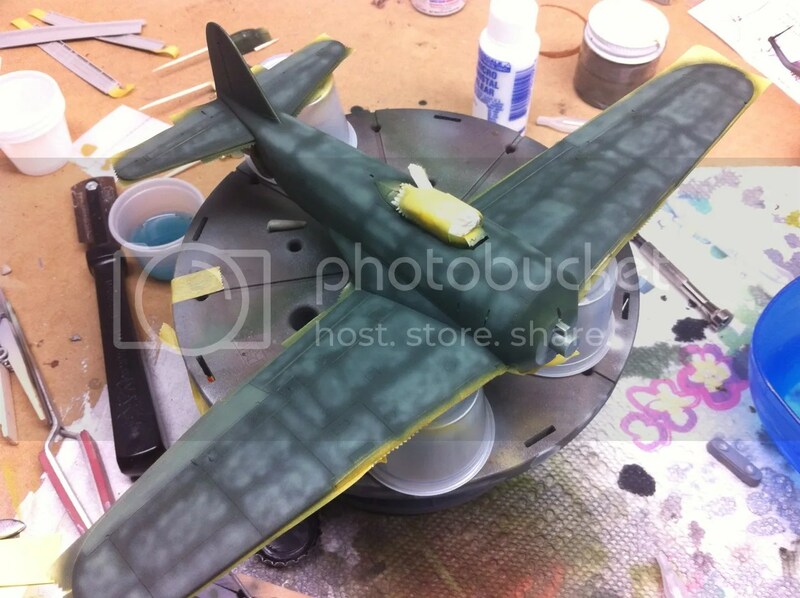 The stuff comes in a rattlecan, but I much prefer the way it handles decanted into an airbrush. Once it’s on and set, it’s rock solid, and probably the most durable paint I’ve ever worked with. On top of the AS-12, I put a coat of Alclad Aluminum. As much as I like AS-12, it has the look, to me, of silver lacquer paint, but it makes an excellent Alclad base and is very foregiving in terms of coverage. 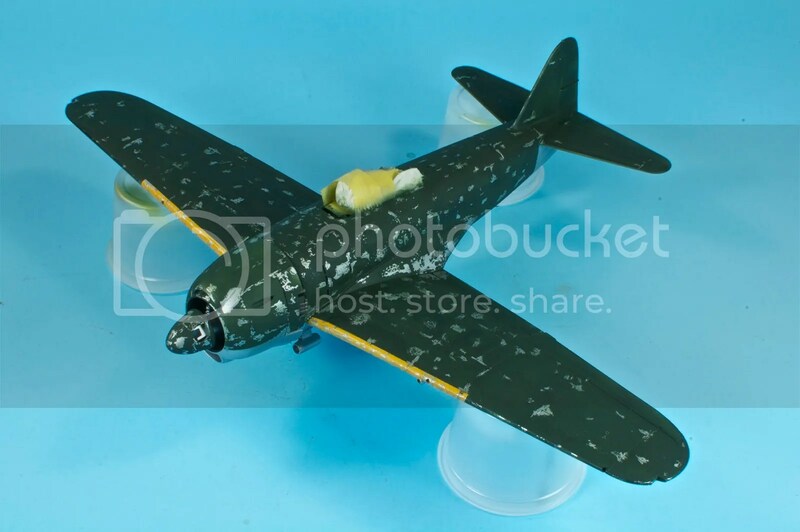 Before starting on the topside, I broke out the Tamiya Ki-84 I mucked up, rechristened as Fail Frank, and gave it a good coat of AS-12. Then I broke out a few different chipping techniques. Prismacolor Silver Pencil – Surprisingly excellent for small amounts of chipping, especially when built up in an area by “tapping” the point over and over. 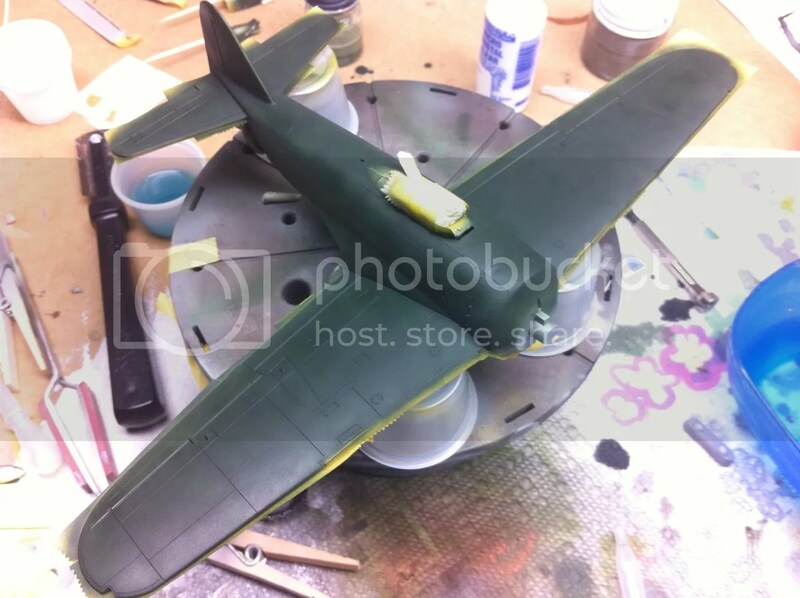 I’ve used the prismacolor pencil on many builds, including my Spitfire VIII. Salt – You know how you put salt on soft pretzels? By putting water on them, then sprinkling on the salt? As the water evaporates the salt adheres lightly to the surface. Instant mask. When you’re done painting, just knock the stuff away with a toothpick. 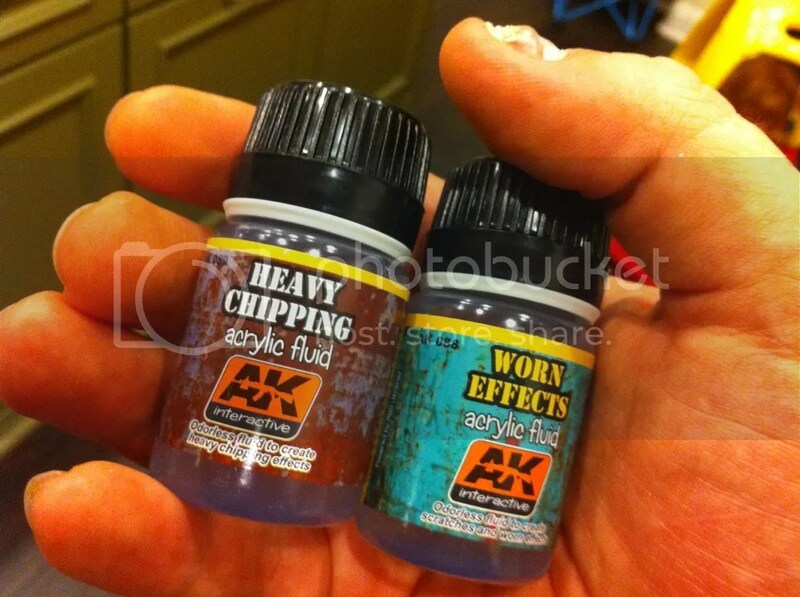 AK Interactive Chipping Fluids – Now these bad boys are interesting. Basically the hairspray method, but in a form that can be easily put through the airbrush. The process is pretty simple – spray this stuff on. 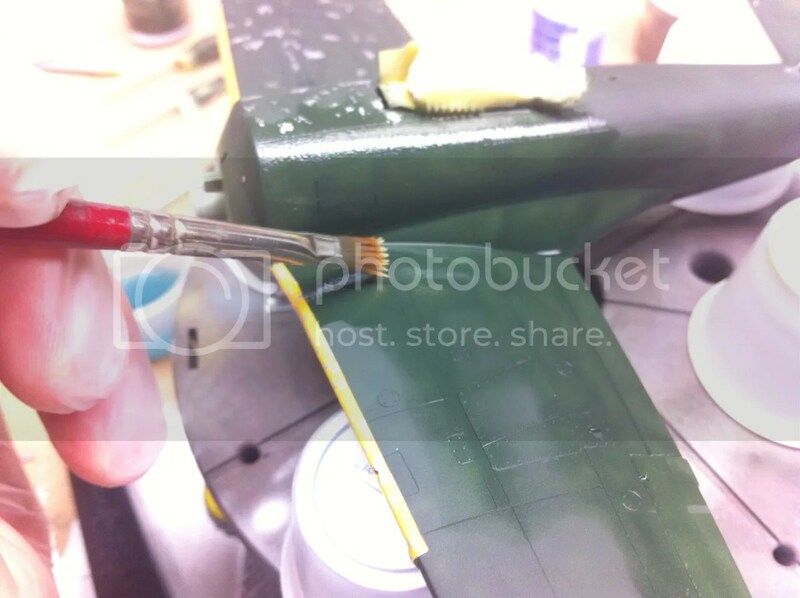 Spray your top coat – which must be acrylic (Tamiya is recommended) on. After giving the paint a few minutes to dry, wet it down with water. The chipping fluid underneath will hydrate, so as you begin picking at the top coat with a brush, a toothpick, or what have you, it will separate easily. AK’s chipping fluids come in two strengths – Worn Effects for light chipping, and Heavy Chipping for, well, heavy chipping. The prismacolor pencil is great for small work, but I’m not sure about large-scale chipping. The salt…I’m pretty convinced I used the wrong kind – this is basic iodized table salt (big blue Morton can). And I overdid the chipping with the fluids. But still, to me Worn Effects showed the most promise. First came the leading edge yellow…which I masked off, sprayed with the chipping fluid, and covered with Tamiya Flat Yellow darkened up a bit with Orange. Then I chipped, with a much lighter hand than I’d used on Fail Frank. The green came next. I started by spraying the chipping fluid, then painted the whole thing in Tamiya JN Green. On top of this, I hit the panels with a 50/50 mix of JN Green and Flat White, using a haphazard spray pattern to keep things from getting uniform. This was then blended back in with a misted coat of thinned JN Green. This was then wetted down and chipped extensively. 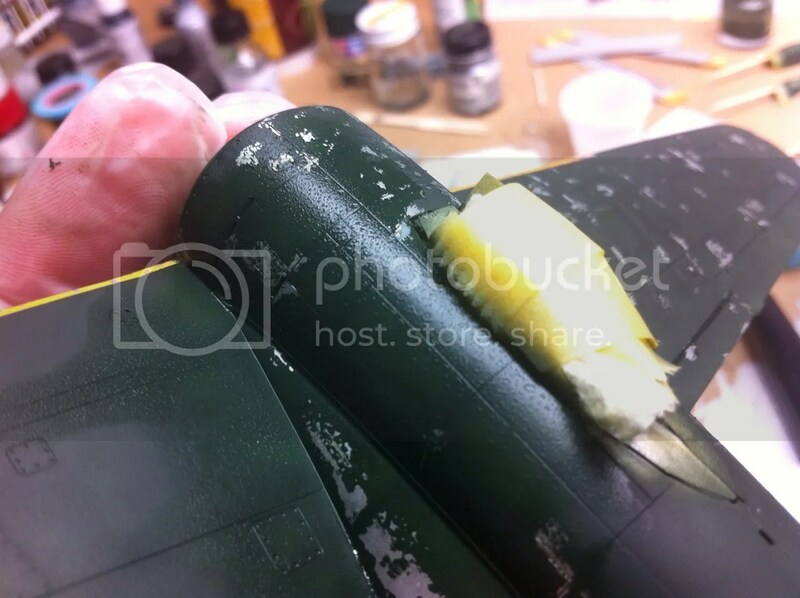 Next up – markings and weathering! Hmmm, I like it. Did you use the Heavy Chipping overall or the Worn Effects?